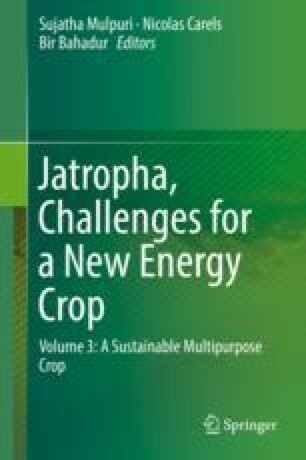 Can One Use Chlorophyll A Fluorescence as a Physiological Marker of Jatropha curcas L.? The Núcleo de Estudos da Fotossíntese (NEF) of the Universidade Federal do Espirito Santo studied the regulation of photosynthesis in J. curcas accessions from different regions of Brazil and the world. The effects of environmental variations of stress factors, such as rainfall and temperature, on the kinetics of chlorophyll a fluorescence (CF) induction in leaves of three genotypes, Janaúba (NEF 01), CPATSA 1501 (NEF 02), and CPATSA C2/10 (NEF 03), were investigated for 4 years. High performance of photosystem II, transpiration rate, and rate of net CO2 assimilation were observed mainly in the NEF 02 accession. Since it was necessary to understand the dependence of tolerance mechanisms to diverse environmental stresses, the NEF team followed the development of these plants in several locations. The coastal region presents warm humid tropical climate, in contrast with an inland region where the temperature is very hot in the summer and cold in winter with extremes around 8 °C. The development of J. curcas plants was affected by the level of photosynthetically active radiation, seasonality of temperature and precipitation, casting doubt on the agroclimatic zoning, which meant that physiological variables needed to be considered. The plants with the best yield were those grown in the inland region, although the photochemical efficiency (PIABS and PITOTAL) and the net assimilation of CO2 (A) of the plants in the coastal region were higher. The molecular mechanisms underlying the species adaptability may serve for modeling plant traits in order to maximize biofuel production and improve the agronomic features.